This episode Mike and Will grab their guidebook, pack their bucket and spade and head off for a terrifying trip to sunny Cornwall in E.F. Benson’s ‘Negotium Perambulans’. Big thanks to Richard Crowest of the ‘Ghost Stories of E.F. Benson’ podcast for giving us permission to use extracts from his reading of this story in the episode. You can find out more about Richard, including his E.F. Benson and ‘Short Stories by Saki’ podcasts, at www.corvidae.co.uk. 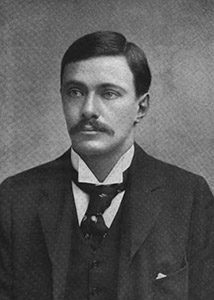 Wikipedia has a good summary of E.F. Benson’s life, including links to information on his fascinating family. Brian Masters’ excellent biography of Benson is a must-read for those interested in learning more about Benson. Negotium Perambulans originally appeared in Hutchinson’s magazine, and was later anthologised in this volume, along side such other Benson classics as ‘And the dead spake…’ and ‘The Horror Horn’. This article contains some interesting insights into this story and its the influence it may have had on H.P. Lovecraft. This illustration from Loneanimator does a great job of capturing the horrifying climax of this story. Seasons greetings listeners! For this special festive episode Mike and Will turn off the lights and dive into the wardrobe for a game of hide-and-shriek, courtesy of A.M. Burrage’s Christmas classic ‘Smee’! Big thanks go to our reader this week Kirsty Woodfield. Also mentioned in this episode were ‘The Dead Room’, the new Mark Gatiss ghost story due to air at 10pm on BBC4 this Christmas Eve. Also Robert Lloyd Parry, who is going to be live-streaming a performance of an M.R. 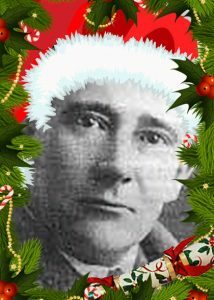 James ghost story on Facebook this Christmas Eve at 7pm. Last but not least, don’t forget to test your M.R. James knowledge with Monty’s Quiz, our brand new (and 100% free) quiz game with over 300 M.R. James-based multiple-choice questions! The easiest way to get hold of the original/full version of this story is to shell out for the ebook from Burrage Publishing. This is the abridged (and free-to-read) version of ‘Smee’ that seems to be doing the rounds online, masquerading as the original story. We believe it has it’s origins as a simplified version of the story intended for those learning English as a foreign language! This biographical essay focuses on Burrages life rather than his ghost stories, but features a wealth of information about the man himself. This interesting essay explored how ‘Smee’ fits in to the wider tradition of Christmas ghost stories. This blog post explored the ‘Mistletoe Bough’, a classic German ghost story dating back to the early 19th century which features an unfortunate bride whose wedding day game of hide and seek turns deadly! The story inspired one of the first celluloid Christmas ghost stories in 1904. Textaphobes beware! This month Will and Mike tackle Henrietta Dorothy Everett’s “The Death Mask”, a supernatural farce about termagant wives, gold diggin’ husbands and menacing fabrics. Monty writes,“Going back a few years I light on Mrs Everett’s The Death Mask, of a rather quieter tone on the whole, but with some excellently conceived stories.” ( Some Remarks on Ghost Stories, The Bookman, 1929). We had our pick of stories from this collection and of course went with the titular (and best) tale. Mrs Everett wrote most of her work under the pseudonym of Theo Douglas, though the anthology ‘The Death-mask’ was published under her own name just three years before her death in 1923, aged 72. We struggled to find much about Mrs E. online, but did reconstruct her family tree and found out about the tragic and horribly noteworthy death of her Grandfather’s brother! That said, we did find that there is a bundle of papers regarding Mrs Everett’s family, together with that of her husband, at the Naval archives in Greenwich. Material for a potential thesis? We’d love to know more about her. There’s a good wikipedia article on the complex set of rules that developed around mourning in the Victorian era. It seems like the mourning expectations for women were more arduous than for men, with women being expected to be in mourning for a husband for 1-4 years, while men got away with mourning for a wife for just 3-5 months! By these standings, Tom has done his fair share. 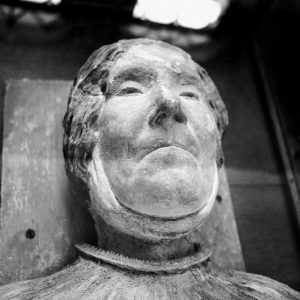 The picture above is the death mask of Grace, Lady Manners of Derbyshire, recorded for posterity after her death. Photo credit to David Brierley.